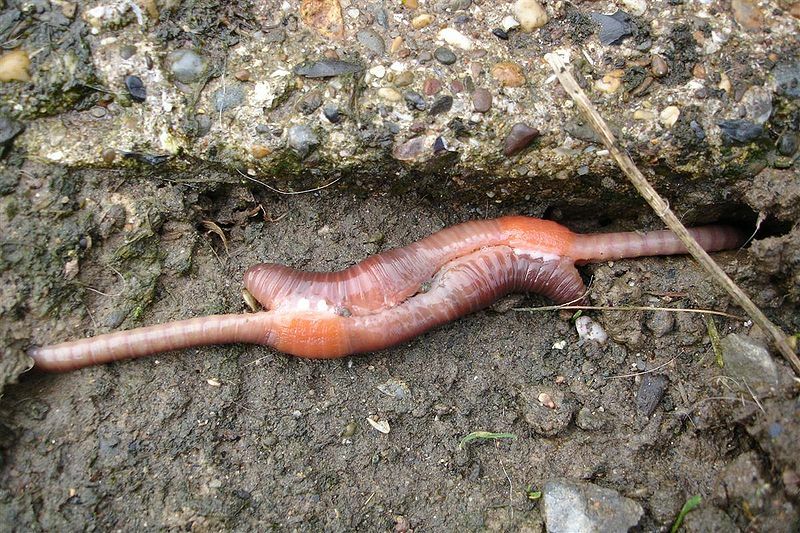 Earthworms are hermaphroditic which means that they contain both male and female reproductive organs. Even though they contain both, there has been no documented cases of self-fertilization. This would be the case if sperm from within the worm fertilized an egg in the same worm. The typical reproduction happens on the surface of the ground or container that holds the worms. Two worms that have reached reproductive age first align themselves head to head. The distinction between juvenile and adult is pretty easy to make based upon the presence or absence of a clitellum. This is a specialized, saddle-like structure that aids in reproduction. A close up view of the clitellum can be seen in the photo to the right. It is the easiest piece the worm's gross anatomy to see. It is actually easier to distinguish than its head! Then, they crawl alongside one another until they are each facing the other's tail so they overlap alongside one another lengthwise. This aligns their male sperm pores with the female pores that contain eggs in a manner so that that each is able to fertilize the other. During this alignment and crawling along side one another, each worm also secretes a fluid that allows for the safe exchange of the sperm. The male pores are located in segment 15 which is one segment behind the one that contains the female pores. Once the sperm has combined with the egg and it has become fertilized, the clitellum actually moves along the worms body. It moves up the body and collects the embryos and places them into cocoons which are expelled from the clitellum near the surface of the substrate. Personally, in my own worm bin, I have found it very common to see cocoons deposited along a piece of cotton or other organic debris that is sturdy and less likely to be consumed by the worms. Eisenia fetida usually create cocoons at a rate of about one per 14 to 21days. These cocoons usually contain 8-20 eggs, however, usually only about two of these actually hatch. Cocoons are very small as can be in the photo of several cocoons next to two sweet peas. They also change color as they age, beginning very light and becoming darker with a reddish tinge before baby worms emerge. In the photo above on the right the cocoon in the center and slightly to the right is most likely the oldest of the cocoons pictured. Check out this AWESOME You Tube video of Eisenia fetida worms hatching from their cocoons! These worms usually live around 1.5 to 2 years, though they have been known to live for up to 5 years.